During the 60's, a certain scent was changing the world: patchouli. It conveyed a sense of freedom and spirituality that was closer to Nature, and the hopes of a generation that was reinventing the future. Tempo is a tribute to this olfactory icon. But it's far from the harsh, humid undergrowth scent of yesterday's touchstone. This a nuanced composition of three patchouli extracts from the Indonesian island of Sulawesi, that hovers between elegant and woody, enveloping and earthy. Elevated by violet leaf, Tempo vibrates on the skin with remarkable sophistication. Sounds like the rebellious, grungy demonstrator of yore has been recast as a retired multi-millionaire with a beach house in Bali, doesn't it? At first, Tempo smells like fresh patchouli leaves (Pogostemon cablin); it's as if you're crushing the leaves between your palms. Mixing with this slightly "chilly" and camphorous green-leaf scent is the aroma of ground pepper (this is my favorite phase of Tempo's development.) After patchouli leaf's close-up fades, a smoother version of patchouli emerges, sweetened for sure but not overly sugary or juvenile in character. Tempo's violet leaf is in the background and smells natural, fresh and clean; it's not the strident, overabundant violet leaf I often smell in men's colognes. The base of Tempo has a "cosmetic" vibe (think "beige" face powder) with silky patchouli mixing with a bit of musk and "milk chocolate." Aside: Tempo contains an aromachemical (woody-musky) that exhausts my nose; this note is noticeable/not noticeable/noticeable, etc., as Tempo's opening fades; Tempo, for several minutes, disappears.This on-off-on effect was noted by two other people I sprayed with Tempo. Many perfume lovers online have compared Tempo to Chanel Coromandel; though their phases of development differ slightly, there's a strong resemblance between the perfumes. (I would need only one of them.) Coromandel and Tempo both have great presence and lasting power (believe it or not, Tempo lasted through TWO soapy showers!) Coromandel gets a slight edge when it comes to complexity, though it fades long before Tempo does. Tempo smells good, if not exciting. If you're in the market for a patchouli cologne that's wearable all year, or a starter patchouli (a Patchouli Primer) — give Tempo a try. Me? I'm a patchouli Ph.D.; I'd like something a little less "elegant" and obedient, something more challenging, sweaty and inventive, like those 60's rebels and their "harsh, humid undergrowth scent." 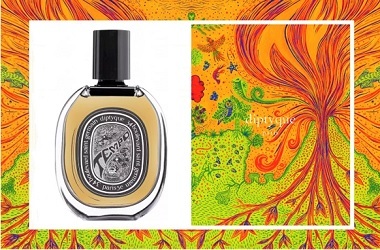 Diptyque Tempo Eau de Parfum is $165 for 75 ml. For buying information, see the listing for Diptyque under Perfume Houses. If you're buying Tempo "blind" — and you shouldn't be! — buy it directly from Diptyque; they'll send you a sample with your purchase and if you don't like (or can't smell) the sample, you can return the full, unopened bottle for a refund. * Perfumer Olivier Pescheux; listed fragrance notes of bergamot, patchouli, mate absolute, clary sage, violet. I have a sample of Tempo. The opening is green and fresh but then it quickly turns into a linear, smooth, boring, patchouli. Either the problem is that Tempo is a *very* linear one-trick pony, or that I don’t like single-note patchouli frags that much, or both (although I love earthy, dirty, rose-patch combos). It’s like having someone squeeze toothpaste in your ear. Ended up scrubbing it off. Still have plenty left so will continue to reapply. Schneeze: bet you had a hard time scrubbing it away! HA! I’d seen some comparisons to Coromandel (one of my faves) so had to try Tempo. Though there was a slight resemblance in the patchouli character, to my nose any similarity ended there. Maybe I’m completely anosmic to the aromachemical though, as Tempo was very soft and short lived to me while Coromandel is more of a (beautiful) monster! Gi: on me, over and over, Tempo triumphed over Coromandel (longevity and sillage). But I’d pick Coromandel between the two. I love patchouli and enjoyed testing this one but I have the family-pack Jumbo-sized bottle of Coromandel, I think I’m set (at least until retirement)! I tried the Fleur de Peau and really loved it but at $165 a bottle, I am not sure I ‘need’ a FB, a nice 15 ml decant would probably be nice. I also have Le Labo Ambrette 9 and Bvlgari’s Au the Blanc which have the same vibe. I will say, both Tempo and FdP are nuclear-strength, they lasted 12+ hours on me. Smokey: yes, those Diptyques go on and on! SmokeyToes, I have a brand new bottle of the Fleur de Peau and would be happy to send you some. If you are interested, shoot me an email at pkwisdom in the land of yahooo. Thanks for the review Kevin. I have a sample that I haven’t tried yet because I’m waiting for the right day. Now I know what I will be smelling, I think I’m really going to like it. On me Tempo was very camphorous and mentholated. Didn’t really like it. Lucas: on me, that was the case for JUST a few minutes. I LOVE camphor so wish I had your experience. I adore camphor, one of the reasons I adore SL’s Borneo so much. Smokey: me, too…when I see it listed in a fragrance I get interested. Wow, talk about timing… Tempo is my SOTD! It’s a pretty, summer weight patch on me. Not a monster by any means. No camphor, but not neutered either. Jalapeno: the first couple of times I wore it I had on 5-6 sprays. One spray would have sufficed I think! I get the sense that we are witnessing the rearranging of the deck chairs on the Niche Titanic, waiting for something like the final stages of the Dutch Tulip Craze! LOL. Tempo was love at first sniff for me and I was too weak to resist. I also ended up getting Fleur de Peau. hajusuuri: so kind of you…but I have a moratorium on shipping samples in this torrid summer weather…things bake in my black mail box! At least I’m “safe” from mail purchases in summer!